Background: Overseas studies suggest that 10–20% of doctors are depressed, 30–45% have burnout, and many report dissatisfaction with work-life balance. A local study on public doctors showed that 31.4% of the respondents satisfied the criteria for high burnout. Young, but moderately experienced doctors who need to work shifts appeared most vulnerable. This study aims to explore the experiences of those public doctors who have managed their work difficulties and maintained professional enthusiasm for references in medical education and continuing professional training. Method: Ten public doctors with reputation were invited respectively from three acute general hospitals for an in-depth interview. Interviews were audio recorded and transcribed. Content analysis was carried out to identify major themes in relation to the research questions. 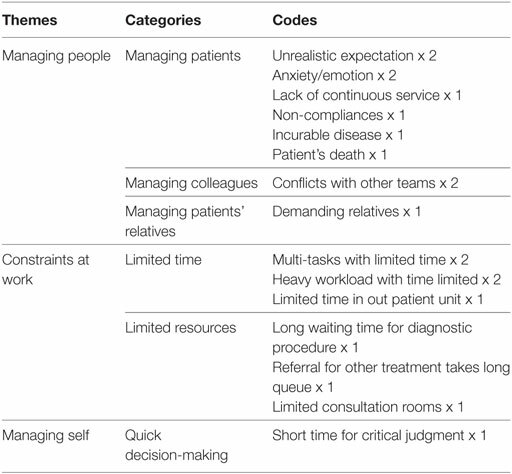 Results: Three themes emerging from difficulties encountered were (1) managing people, mostly are patients, followed by colleagues and then patients’ relatives; (2) constraints at work, include time and resources; and (3) managing self with decision-making within a short time. Three themes generating from managing work difficulties included (1) self-adjustment with practicing problem solving and learning good communication appeared more frequently, followed by maintaining a professional attitude and accumulating clinical experiences; (2) seeking help from others; and (3) organizational support is also a theme though it is the least mentioned. Four themes emerging from maintaining work enthusiasm were (1) personal conviction and discipline: believing that they are helping the needy, having the sense of vocation and support from religion; disciplining oneself by continuing education, maintaining harmonious family relationship and volunteer work. (2) Challenging work: different challenging natures of their job. (3) Positive feedback from patients: positive encounters with patients keep a connectedness with their clients. (4) Organization support: working with good colleagues and opportunity for continuous training. Conclusion: Some implications for medical education include, developing good communication skill for medical students and junior doctors, preparing senior doctors to be mentors, and exploring the motivating force of spirituality/religion. Hong Kong is a metropolitan city with more than seven million people living in a rather small area. The healthcare services are provided by both public and private sectors. The doctor to patient ratio is 1.9 doctors per thousand population, which is lower in comparison to the advanced countries such as 3.7 in Britain, 3.3 in United States, 2.3 in Japan, 2.6 in Korea, and 3.0 in Singapore (1). There are two universities for the training of doctors. All locally trained doctors will be recruited by the Hospital Authority (HA) to be placed in the public hospitals after their graduation for residency. They mostly work in the public hospitals to gain clinical experiences and develop specialty expertise before changing to private practices. The HA is a body incorporated in the Hong Kong Special Administrative Region which manages and develops the public hospital system and offers more than 90% of all hospital services. There are 42 public hospitals and institutions scattered over seven clusters in Hong Kong. The HA employs 75,000 staff in which 6,000 are doctors (2). Healthcare industry is one of the high risk entities worldwide because of its high volume of users, complexity of procedures, and involvement of many stakeholders. Overseas studies showed that healthcare professionals are under great stress and prone to burnout though they are providing incredibly meaningful and personally fulfilling jobs (3, 4). In a national survey of burnout in a large sample of U.S. physicians and a probability-based sample of the general U.S. population for comparison, it was found that burnout is more common among doctors than among other U.S. workers. Furthermore, doctors at frontline of care seem to be at greatest risk (5). In Hong Kong, doctors are also under great risk when performing their duties in public hospitals, where patient beds are usually fully occupied and the workload is high, particularly if they are unprepared to face crisis at work. In a cross-sectional survey of 226 valid questionnaires returned from 1,000 randomly selected public doctors in Hong Kong using the Maslach Burnout Inventory (MBI), 31.4% of the respondents suffered from high burnout. Young, but moderately experienced doctors who need to work in shifts appeared most vulnerable (6). If doctors are under great stress and prone to burnout, it not only affects their well-being, but also can lead to human errors which may cause harm to patients. What work difficulties the public doctors are facing in Hong Kong? How do they manage these difficulties? And how they maintain their professional enthusiasm especially for those public doctors working in acute general hospitals with heavy workload? Professional enthusiasm in this study is referred to healthcare professionals, such as doctors who manage to remain consistently engaged in their career and motivate themselves for best performances. Since there has been a paucity of research in studying the resilience of public doctors in facing the high expectation of the public in the healthcare system, this study was aimed to explore the experiences of those public doctors who have managed their work difficulties and maintained professional enthusiasm for reference in medical education and continuing professional training. The well-being of doctors affected by stress and burnout has been an emerging concern in western countries for many years (7, 8). In current measures of burnout, the MBI is frequently used. Though there are arguments that MBI is limited by arbitrary cutoffs and may not have sufficient theoretical grounds (9, 10), it can be used for screening of symptoms of burnout and raise one’s awareness about the early signs (11). Overseas studies showed that doctor’s suicide rates are substantially higher compared with the general population (12, 13). However, doctors are slow to seek help (14), owing to fear of judgment, stigma, and punitive action (15, 16). Fear of stigmatization is not only present when they are performing duties as doctors, but as early as they are trained as medical students. At medical school, the competitiveness, the quest for perfection, and the fear of showing vulnerability have been cited as triggers for mental ill health. A study by Schwenk, Davis, and Wimsatt (17), on depression, stigma, and suicidal ideation in medical students in a university in U.S. revealed that 53% of respondents who reported high level of depressive symptoms were worried that revealing their illness would be risky for their career. And 62% expressed that asking for help would be admitting their coping skills which were inadequate. It is commented in this research that the characteristics of medical education emphasizing professional competence and outstanding performance may reinforce stigmatization and hinder medical students with mental problems to seek help. Furthermore, professional demand on making life and death decisions, which should not be wrong, adds extra pressure to them. For those who seek perfection, any sense of making mistakes makes them feel very anxious. Western studies suggested that 10–20% of doctors were depressed, 30–45% have burnout, and many reported dissatisfaction with work-life balance (5, 18). Other studies showed that there were increased rates of self-medication, alcoholism, and other harmful behaviors among doctors who tried to cope with stress and burnout on their own for fear of losing their medical licenses if they reported mental stress (19–21). Though there are cultural differences, studies in Asian countries also show that doctors are under stress and prone to burnout in public hospitals. A survey study in Mainland China on 1,202 registered hospital doctors indicated that occupational stress was strongly related to burnout among hospital doctors in China. Some factors relating to burnout identified were dissatisfaction with doctor–patient relationship, working more than 40 h per week, low level of supervisor support, low coworker support, high job demands, and low reward (22). A nationwide questionnaire survey on stress, personal characteristics, and burnout among 555 first postgraduate year residents in Taiwan showed that working environment, emotional pressure, and demands from patients were their primary sources of stress. Burnout was positively correlated with stress, neuroticism, negative affectivity, disengagement coping, and weekly work hours. It was suggested that resident’s personal characteristics were closely related to stress and burnout. Therefore, in addition to assisting their work-related stress, exploring their personal characteristics should be taken into account for early identification of residents at risk of burnout (23). A cross-sectional survey on 1,000 doctors randomly sampled from the Hong Kong Public Doctors’ Association registry in which a total of 226 questionnaires returned were analyzed, 31.4% of the respondents satisfied the criteria for high burnout. Young, but moderately experienced doctors who needed to work in shifts appeared most vulnerable (6). All these studies showed that medical students, residents, and young doctors are more prone to stress and burnout with risk of depression and suicide. In the universities, student counseling, support groups, and lectures focusing on stress reduction and coping strategies have been provided. Some medical schools in the west initiated health-promotion programs which have been reported to have positive results in reducing the negative effects of stress upon the health and academic performance of medical students (24, 25). A life skill program developed in Duke University (26) has been found to reduce hostility, cynicism, aggression, and maladaptive clinical decision-making in the U.S. medical students (27). A pilot comparison study of Chinese medical students in one university in Mainland China showed that the program was also effective (28). Studies pointed out that residents are facing lots of stressors, such as long work hours, sleep deprivation, and decline in personal and professional relationships (29–31). Resident wellness programs employing lectures, workshops, or exercises to actively educate residents about the pitfalls of burnout and the habits of wellness have been provided in some hospitals (32–34). Evidences showed that residents involved in these types of programs have demonstrated reduction in burnout scores (35, 36). Regarding strategy to help individual doctor improve their well-being, a computer-based, interactive, and individualized intervention program was found to be effective to promote behavioral change (37). The study involved 1,150 U.S. surgeons. It was a three-step interactive, electronic intervention. 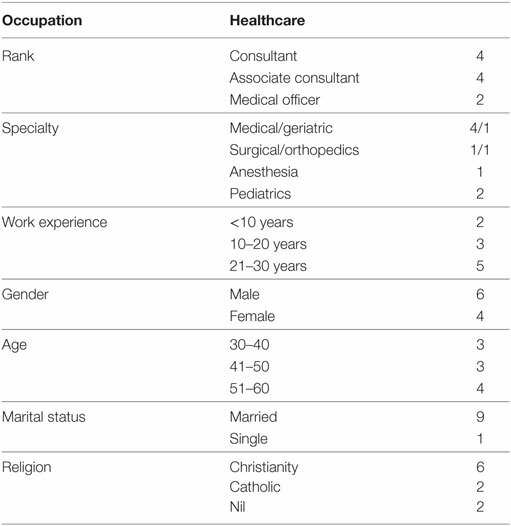 First, the surgeons subjectively assessed their well-being relative to other colleagues. Second, they completed the seven-item Mayo Clinic Physician Well-Being Index and received an objective, individualized feedback about their well-being relative to national physician norms. Third, they evaluated the usefulness of the feedback and whether they intended to make specific changes as a result. Relating to the organization level, provision of counseling services were necessary, it was also suggested that senior doctors should improve their supervisory skill to provide professional guidance to junior doctors; certainly role models were of paramount importance (38). Can we learn from the experiences of doctors of good reputation on how they manage their difficulties at work and maintain their professional enthusiasm? A qualitative case study approach was adopted. With the help of the nursing administration department of three acute general hospitals of the New Territories East Cluster in Hong Kong, three doctors who were acknowledged to be devoted in their profession were recommended for the study from their department heads between September 2014 and May 2015 from each hospital, respectively. These participants have good performances in their department and frequent compliments were received from patients and relatives. After the recommendation, research assistant invited them for an in-depth interview individually via email and phone call. As purposive samples in the qualitative studies, collection of data can be completed once the data approach saturation. Originally, it was planned to collect data from nine participants, in order to enrich the content of the study, one more participant was invited for interview to reach the data saturation [(39) p.87]. Totally, 10 doctors were successfully interviewed. Each interview lasted between 45 min to one and half hours. A semi-structured interview guide (Presentation 1 in Supplementary Material) was used to facilitate the in-depth interviews, which were conducted by the first author. The topics included: the perceptions of their work, overcoming work difficulties, maintaining professional enthusiasm, impressive experiences, concept, and practice of holistic care. The full report of the research was published in Chinese (40), only the part related to their managing work difficulties and maintaining professional enthusiasm were reported in this paper. The implications for medical education and continuing professional training were discussed. The study was approved by the Joint Chinese University of Hong Kong-New Territories East Cluster Clinical Research Ethics Committee (CREC Ref. no: 2014.385). All participants were given explanation of the purpose of the study. Voluntary participation and confidentiality were assured. Informed written consent was obtained from each participant including audio recording of the interview and publication of the research findings. All the records would be destroyed after the publication of the research report. The interviews were tape recorded and transcribed. The coding approach suggested by Miles and Huberman (41), to create a general accounting scheme for codes was used. The data were then analyzed using content analysis approach (42). The majority views of the participants were grouped into categories. Consensus was obtained by the first and the second author during the process of developing the codes and categories in the data analysis stage. Finally, the results were shared with the participants for checking to ensure validity. Ten participants were interviewed, including Consultants, Associate Consultants, and frontline Medical Officers. As the Department of Medicine is the main department in the hospital, half of the participants were from this department. Others were from surgical, anesthesiological, and pediatric departments. Working experience ranged from less than 10 to 30 years; over half of them were male. Age ranged from 30 to 60. Most of them were married and had contact with a religion. Please see Table 1 for the detail distribution. Table 1. Background information (N = 10). The difficulties they encountered were mainly from (1) managing people, mostly of patients, followed by that of colleagues and relatives of patients. (2) Constraints at work, including time and other resources. (3) Managing self, for the need to make quick decision. Details can be seen in Table 2 and some of the descriptions were as follows. Table 2. Codes, categories, and themes of difficulties encountered at work. Managing work difficulties could be categorized into three themes. (1) Self-adjustment. (2) Seeking other’s help. More people mentioned self-adjustment, among which practicing problem solving, learning good communication, and maintaining professional attitude appeared more frequently, followed by increasing clinical experiences. Other’s help came mainly from colleagues. (3) One participant mentioned that good organization support was also one of the helping resources. Details can be seen in Table 3 and some descriptions are as follows. Table 3. Codes, categories, and themes of managing work difficulties. From the analysis of data, four themes could be generated. (1) Personal conviction and discipline: participants were motivated by one’s belief that they are helping the needy, having the sense of vocation, and support from religion. Another category included disciplining oneself by continuing education, maintaining harmonious family relationship and volunteer work. (2) Challenging work: devoting to their jobs was also influenced by different challenging natures of their job. (3) Positive feedback from patients: positive encounters with patients keep a connectedness with their clients. (4) Organization support: good management is also a theme though it is the least mentioned. Details of the categories and codes can be seen in Table 4 and some descriptions are as follows. Table 4. Codes, categories, and themes relating to maintaining professional enthusiasm. What work difficulties the public doctors are facing in Hong Kong? The findings of this study showed that the main difficulty is from patients with time constraint. With different expectations from patients, plus the heavy workload, public doctors face tremendous stress. When one is sick, be it due to physical or mental problem, it will lead to bodily disequilibrium with emotional instability. The condition will even be worse when the persons have to be admitted to hospital as patients for treatment. The patient’s relatives are also anxious for their loved ones, particularly for the dying patient where hospital will be the place for ending life. Public doctors will see people from all walks of life with different kinds of diseases and various expectations. It is understandable that caring for them would be difficult in acute public hospitals where the workload is usually heavy. They have to fulfill their roles in diagnosis and treatment within certain time limit. The stress is even higher in times of medical emergencies for saving life. The findings in this study illustrated why public doctors find it difficult to take care of patients’ needs, especially for young doctors who have not gained sufficient clinical experiences. As echoed by Sung (43), Vice Chancellor, the Chinese University of Hong Kong, the turnover rate of beds, burdensome, and time-consuming paperwork, the fear of malpractice litigation, may make the younger generations of doctors feel more difficult to find satisfaction and self-actualization in the clinical job and become physically and emotionally exhausted. It is consistent with an overseas study that more than 1/4 of young doctors experience burnout (20). A local cross-sectional survey of public doctors also showed that 31.4% of the respondents satisfied the criteria for high burnout. Young, but moderately experienced doctors who need to work in shifts appeared most vulnerable (6). 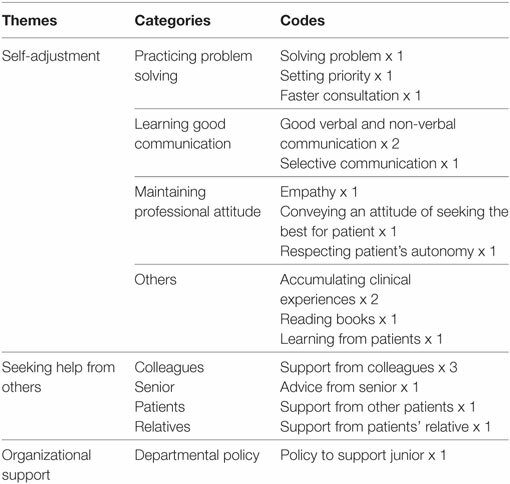 Regarding managing difficulties at work, this study revealed that practicing problem solving in setting priorities, learning good communication with patients, maintaining professional attitude, and accumulating clinical experiences are strategies used by them in self-adjustment. While seeking help from colleagues and organization support are also important. The findings in this study are consistent with some of the findings of the study by Jensen et al. (44) about building physician resilience. Self-adjustment starts from acceptance of professional demands and awareness of personal limitation both in time and expertise. With balance and prioritization, one can set limits and manage the workload. Seeking professional support from peers, consultants, and multidisciplinary teams together with personal support from family members and friends are also highlighted. However, good communication skill is very much prominent in this study, since good communication can prevent misunderstanding. Furthermore, an empathetic attitude can build up trust, lessen complaints, and provide better care instead. The importance of communication with patients are frequently mentioned during medical education, however, it is usually more focused on gathering accurate data in facilitating diagnosis. Therapeutic communication with a caring attitude is an important value which needs to be developed, practiced, and become a habit of showing empathy in doctor–patient relationship. As suggested by Sung (43), it is difficult to teach values and ethics in classrooms, it has to be taught or caught by examples. Setting up models by senior doctors can support junior doctors in their initial career path and prepare them to be caring seniors in the future. The finding of this study also showed that accumulating clinical experiences will help to manage the time constraints for medical consultation. It is understandable that practices make perfect. Doctors learn to recognize different patterns of diseases’ presentations, so with more experiences they can make the diagnosis faster and more accurately. However, junior doctors need more time to practice, consolidate their professional knowledge and skills. Generally speaking, in a specialist medical clinic, one doctor has to see around 30 patients at least within 3 h in an afternoon session, spending average 6 min for each patient. Under this time constraint, it is difficult for them to have better understanding and therapeutic communication with patients. Adding more resources to support junior doctors remains to be an important issue to be solved by the HA. 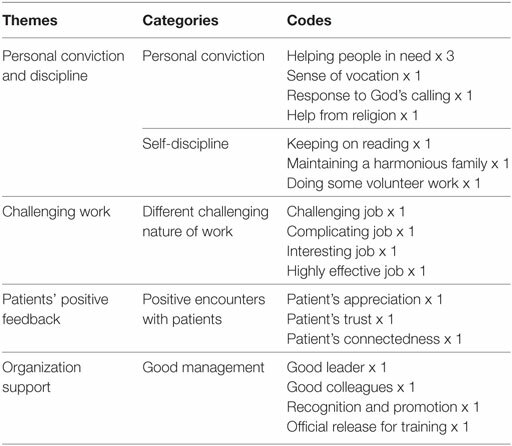 With regards to maintaining work enthusiasm, the findings in this study showed that it comes mainly from personal conviction in the belief of helping people in need and a sense of vocation; self-discipline in terms of continuing education, keeping a harmonious family, and participating in some voluntary works. All these are consistent with findings and suggestions made by both local and overseas studies (44–46). Most of the participants in this study are with religious background; getting help from religion may become one of the elements in keeping their work enthusiasm. Besides, many studies support religion as a protective factor in individual support and coping (47–50). Second, having a challenging job is also a motivator. This study also revealed that positive feedback from patients is one motivator for keeping the working spirit. It is consistent with findings from some local studies that patients’ recovery and their appreciation will definitely encourage healthcare professionals to stay serving in the public hospitals and continually committing in their helping professions (40, 51, 52). Regarding another finding of the support from organization, the HA of Hong Kong has set up a psychological care department called “Oasis” to offer psychological support to staff by means of conducting courses for personal growth and managing stress. Furthermore, it also provides individual counseling and crisis intervention after clinical incidents in hospitals. However, due to the heavy workload in acute general hospital, it is not easy for department heads to officially release staff to attend these courses. Using a computer-based, interactive, and individualized intervention for promoting well-being, such as the one conducted by Shanafelt et al. (37) for the U.S. surgeons, can be considered as an alternative method to be implemented for professional staff locally. They can join the training according to their appropriate time. There are some implications from this study for medical education and continuing professional training. First, developing good communication skill in terms of conveying a caring attitude is important in medical education both for medical students and young doctors. Second, preparing senior doctors to become good leaders and mentors are necessary in helping young doctors to adjust faster in the beginning of the career life. Finally, the motivating force of religion in enriching one’s life is worth further exploration. The study was approved by the Joint Chinese University of Hong Kong-New Territories East Cluster Clinical Research Ethics Committee (CREC Ref. no: 2014.385). All participants were given explanation of the purpose of the study. Voluntary participation and confidentiality were assured. Written consent in accordance with the Declaration of Helsinki was obtained from each participant. All the records would be destroyed after the publication of the research report. AL is responsible for the study design, data collection, data analysis, and report writing. AY takes part in study design and data analysis. The Supplementary Material for this article can be found online at http://www.frontiersin.org/articles/10.3389/fpubh.2018.00019/full#supplementary-material. 2. Hospital Authority. Annual Report 2015–2016. Hong Kong: Hospital Authority (2016). 6. Siu CFY, Yuen SK, Cheung A. Burnout among public doctors in Hong Kong: cross-sectional survey. Hong Kong Med J (2012) 18(3):186–92. 16. Myers MF. Medical marriages and other intimate relationships. Med J Aust (2004) 181(7):392–4. 26. Williams V, Williams R. Lifeskills: 8 Simple Ways to Build Stronger Relationships, Communicate More Clearly, and Improve Your Health. New York: Random House (1997). 36. Ospina-Kammerer V, Figley CR. An evaluation of the respiratory one method (ROM) in reducing emotional exhaustion among family physician residents. Int J Emerg Ment Health (2003) 5(1):29–32. 39. Polit DF, Beck CT. Essentials of Nursing Research: Appraising Evidence for Nursing Practice. Philadelphia: Lippincott Williams & Wilkins (2014). 87 p.
40. Luk L. Holistic Care: Case Studies. Hong Kong: Nethersole Institute of Continuing Holistic Health Education (2017). (In Chinese). 41. Miles MB, Huberman AM. Qualitative Data Analysis. Thousand Oaks, CA: SAGE (1994). 42. Morse JM, Field PA. Nursing Research: The Application of Qualitative Approaches. 2nd ed. London: Chapman & Hall (1996). 44. Jensen PM, Trollope-Kumar K, Waters H, Everson J. Building physician resilience. Can Fam Physician (2008) 54(5):722–9. 45. Ben-Shahar T. Happier: Learn the Secrets to Daily Joy and Lasting Fulfillment. 1st ed. New York: McGraw-Hill (2007). 46. Fok S, Luk L. The clinical experiences of oncology professionals: how to survive through work difficulties. Macau J Nurs (2015) 14(2):24–31. 51. Lee YC, Ma L, Hui PL, Luk L. I Chose to Change: Living with Chronic Pain – Stories from Patients. Hong Kong: Nethersole Institute of Holistic Health Education (2015). 52. Luk L. The working experiences in the transdisciplinary team for chronic pain. Macau J Nurs (2015) 14(1):8–12. Copyright: © 2018 Luk and Yau. This is an open-access article distributed under the terms of the Creative Commons Attribution License (CC BY). The use, distribution or reproduction in other forums is permitted, provided the original author(s) and the copyright owner are credited and that the original publication in this journal is cited, in accordance with accepted academic practice. No use, distribution or reproduction is permitted which does not comply with these terms.